An unaltered photocopy of your DD-214 other military issued document clearly displaying your award of the Defense Superior Service Medal. This Display Recognition is available ONLY to authorized recipients who have already received their award and possess orders, or authorization form, or release documentation as confirmation. (See "Issue Requirements"). To obtain either a Display Medal or a Display Recognition for your authorized award you will be required to provide military-issued documentation authorizing your award. There are no exceptions. Description. Obverse: A silver color metal and enamel pendant 1 7/8 inches (4.76cm) in height overall consisting of a medium blue pentagon point up superimposed by a silver eagle with outspread wings charged on its breast with the shield of the United States and grasping in its talons three crossed arrows (as depicted on the seal of the Department of Defense) all silver, the wings projecting over and surmounting a silver arc encircling the top and sides of the pentagon and bearing nine conjoined silver stars above the wings, and two on each side below the wings, terminating in a silver wreath encircling the base composed of a laurel branch on the left and an olive branch on the right, the wreath surmounted by the extended ends of the arrows in base; at the top of the pendant a group of five graduated silver rays extending above the stars. Reverse: On an arc at the top the inscription "For Superior Service" above the pentagon which bears the inscription "From The Secretary of Defense To", all silver. Symbolism: The pentagon refers to the five armed services, the Army, Marine Corps, Navy, Coast Guard (in time of war) and Air Force. It also alludes to the headquarters of the Department of Defense. The configuration of the eagle bearing the shield of the United States and grasping three arrows upon a medium blue background together with an arc of thirteen stars and wreath of laurel and olive refers to the seal of the Department of Defense and indicates the award of the medal in the name of the Secretary of Defense. The conjoined stars and silver rays signify unity and excellence in the performance of the mission of the Department of Defense on behalf of the Nation. Ribbon: A ribbon 1 3/8 inch (3.49cm) in width composed of the following vertical stripes: Golden Yellow 3/16 inch (.48cm), Bluebird 1/4 inch (.64cm), White 3/16 inch (.48cm), Scarlet 1/8 inch (.32cm), White 3/16 inch (.48cm), Bluebird 1/4 inch (.64cm) Golden Yellow 3/16 inch (.48cm). Background: a. Authorized by E.O. 11904, February 6, 1976.
b. The Defense Superior Service Medal (DSSM) shall be awarded only to members of the Armed Forces of the United States who, after February 6, 1976, rendered superior meritorious service in a position of significant responsibility. Only under the most unusual circumstances will DSSM be awarded as an impact award for outstanding TDY achievement. The DSSM is specifically intended to recognize exceptionally superior service, and to honor an individual's accomplishments over a sustained period. c. The DSSM shall be awarded only by the Secretary of Defense. (1) The Director, Joint Staff, for the Chairman of the Joints Chiefs of Staff has been delegated approval or disapproval authority for Service members assigned to the Joint Staff, and those Service members assigned to Joint organizations. That authority may not be delegated further. (2) Approval or disapproval authority for all other qualifying Service members is delegated to the DA&M, OSD, for the ASD (FMP). The authority may not be delegated further. d. The DSSM shall be placed in precedence after the MOH, the Superior Service Crosses of the Services, the DDSM, the Superior Service Medals of the Services, and the Silver Star, but before the Legion of Merit. e. Recommendations approved by the Chairman of the Joint Chiefs of Staff shall be processed entirely by the Joint Staff. All other recommendations shall be forwarded to the Chief, Military Personnel Division, Personnel and Security Directorate, WHS, for processing. Recommendations should be submitted no later than 90 days before desired presentation date. The Defense Superior Service Medal was established by Executive Order 11904 signed by President Gerald R. Ford on February 6, 1976. The Defense Superior Service Medal has been in effect from February 6, 1976 to the present. The Defense Superior Service Medal is awarded by the Secretary of Defense to any member of the Armed Forces of the United States who, after February 6, 1976, renders superior meritorious service in a position of significant responsibility while assigned to a joint activity. The Defense Superior Service Medal is worn after the Silver Star but before the Legion of Merit. Additional awards are denoted by oak leaf clusters, except in the case of the Coast Guard. Until 1998, additional awards to Coast Guard personnel were denoted by a gold star five-sixteenths of an inch in diameter. In 1998 the Coast Guard authorized its members to wear the oak leaf cluster on this decoration to denote subsequent awards; however, previously authorized gold stars will continue to be worn. 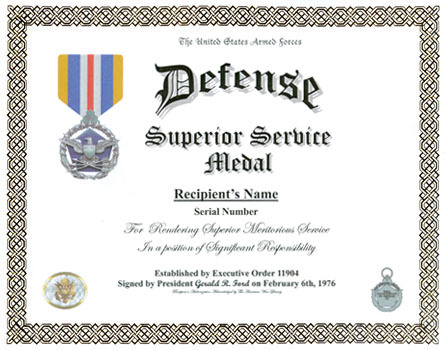 The design of the Defense Superior Service Medal was adapted from that of the Defense Superior Service Medal, which was designed by Mildred Orloff and sculpted by Lewis J. 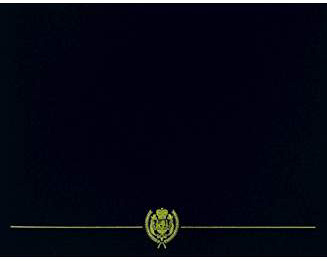 King, Jr., both of the Army's Institute of Heraldry. The first Defense Superior Service Medal was awarded to Brigadier General John G. Jones, U.S. Army, in March of 1976 for "exceptionally superior service as Military Assistant to the Deputy Secretary of Defense from February of 1972 to July of 1975." The Defense Superior Service Medal is silver in color and one and seven-eighths inches in overall height. It features a medium-blue enameled pentagon (point up) superimposed by a silver eagle with outspread wings. The eagle's breast is charged with the shield of the United States, and the eagle is shown grasping three crossed arrows in its talons. The pentagon and eagle are enclosed within a silver pierced circle consisting in the upper half of thirteen stars and in the lower half of a wreath of laurel (on the left) and olive (on the right). At the top of the medal is a suspender composed of five graduated silver rays which extend above the stars. The Defense Superior Service Medal is rich in symbolism: the eagle grasping the arrows is taken from the seal of the Secretary of Defense and is the American bald eagle, symbolic of the Nation. The pentagon in the background alludes to the five branches of the Armed Forces (the Army, Navy, Marine Corps, Air Force, and Coast Guard). It also alludes to the headquarters of the Department of Defense, which is housed in the Pentagon. The configuration of the eagle bearing the shield of the United States and grasping three arrows upon a medium of blue background together with an arc of thirteen stars and wreath of laurel and olive refers to the seal of the Department of Defense and indicates the award of the medal in the name of the Secretary of Defense. Additionally, the conjoined stars and silver rays signify unity and excellence in the performance of the mission of the Department of Defense on behalf of the United States. The thirteen stars represent the thirteen colonies, and through them, all of the states. The olive branch represents the goal of defense (peace) while the laurel branch represents achievement. On the reverse of the pentagon in the center of the medal is the inscription FROM / THE SECRETARY / OF DEFENSE / TO, with space beneath for inscribing the recipient's name. On the reverse of the ring bearing the stars (and above the pentagon) is the inscription FOR SUPERIOR SERVICE. The ribbon consists of a central stripe of red, flanked on either side by stripes of white, blue and gold. Source: The provisions of Executive Order 11904 of Feb. 6, 1976, appear at 41 FR 5625, 3 CFR, 1976 Comp., p. 90, unless otherwise noted.